''Are quasars located at cosmological distances, as Hubble's redshift/distance relationship assumes? Or, are they evidence of a serious flaw in our understanding of the natural laws that govern the behavior of large-scale phenomena? ''Halton C. Arp was one of the key actors in the contemporary debate on the origin and evolution of galaxies in the universe. His landmark compilation of peculiar galaxies led him to challenge the fundamental assumption of modern cosmology, that redshift is a uniform indicator of distance. Dr. Arp was born in 1924, a distant cousin of the French painter Jean Arp. He studied at Caltech, and as a graduate student he specialized in the study of distant galaxies. One major characteristic of these galaxies is that they all have an observable redshift in their spectrum. Astronomers can only understand the universe by analyzing the light the comes from a celestial object. A major way of breaking down the light for study is to split it into its component colors with a prism. When raindrops act as a prism, we get the rainbow. Astronomers add a slit, which focuses the colors of starlight into a band. Quantum mechanics describes how atoms absorb and emit light in only very specific colors. Whenever a gas of hot atoms glows, like on the surface of a star, we know in what colors that gas should glow. If a galaxy, which is composed of millions of stars, is coming toward us, or going away from us, those specific colors change just slightly. This is called the Doppler Shift, and is the same effect that causes a car's horn to change pitch as it passes you. If a galaxy is coming toward us, the specific colors of atoms become slightly bluer. If the galaxy is going away they become redder. Astronomers call this blueshifting and redshifting. All of the distant galaxies Arp observed were redshifted, meaning they are travelling away from us. Astronomers interpret this to mean that the fabric of the universe is expanding, pulling all the galaxies away from all the other galaxies. The farther a galaxy is away from us, the more intervening space there is to expand. This extra distance "pushes" the galaxy away faster, making the specific colors appear redder the farther away a galaxy is from us. The distance to all but the nearest galaxies is virtually impossible to measure by most techniques, and the remaining techniques require a supernova to erupt in a galaxy to facilitate the measurement of the distance. Astronomer Edwin Hubble solved this problem by applying the redshift-distance relationship in reserve, assuming the distance to a galaxy is related to its redshift by Hubble's Law, so all an astronomer needs to do is measure the galaxy's redshift, and the distance to that galaxy can be computed. Arp became a technically excellent photographer of galaxies. 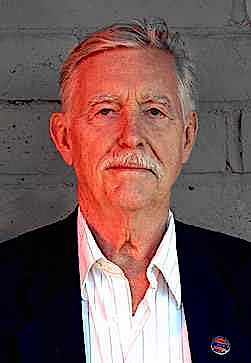 He received his Ph.D. in 1953 and joined the staffs of Caltech's Mount Wilson and Palomar Mountain observatories. This gave Arp the opportunity to work with some of the largest telescopes in the world, including the 200-inch Hale Telescope. Arp became especially interested in galaxies that have a unusual or abnormal shapes. He felt that by studying the peculiar galaxies, we could understand how galaxies form and why most of them fall into the elliptical or spiral shape classes. (The remainder are grouped together into the "irregular" classification). 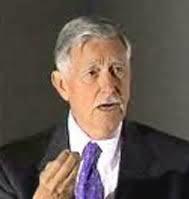 Arp received the American Astronomical Society's Helen Warner Prize. This Prize is awarded annually to the astronomer under 35 years old who, in the opinion of the award committee, has performed the best research in astronomy. To promote the study of unusual galaxies, Arp compiled the Atlas of Peculiar Galaxies, which is the basic reference work on 338 of the most striking of these objects. As Arp was completing his Atlas in the 1960s, quasars were discovered. These star-like objects have a very high redshift, implying that they are tremendously distant. This would mean that they are unrelated to the closer-in galaxies that Arp was photographing on a regular basis. Even though Arp subscribed to Hubble's Law, he decided to do a study of the newly discovered quasars and see if they are uniformly scattered throughout the sky. Arp concentrated his analysis on the areas around his beloved peculiar galaxies. By analysing photographs of peculiar galaxies, Arp determined that there are more quasars around the peculiar galaxies than in other sections of the sky. 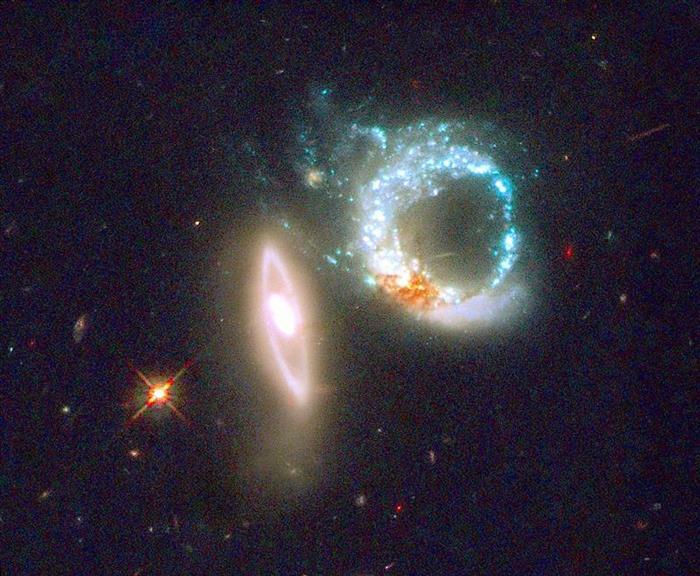 Arp could not measure if the quasars that appeared to be clustering around the peculiar galaxies are actually physically related to peculiar galaxy since he could only measure the distance to galaxies and quasars by Hubble's Law, which puts the quasars much farther away than the peculiar galaxies. But if they are so much farther away, why would there seem to be more of them "hiding" way behind the peculiar galaxies? "Forty years after the discovery that galaxies were independent stellar systems, we still have not penetrated very far into the mystery of how they maintain themselves or what physical forces are responsible for shaping their observed forms. The galaxies are the constituent units of mass and energy in the Universe, and yet we are still challenged by such questions as: What causes the characteristic shape of spiral galaxies? How are elliptical galaxies related to spirals? How are galaxies formed, and how do they evolve? It is difficult to resist an oversimplified impression of what a galaxy is because the Hubble classification divides the galaxies into the well-known categories of smooth amorphous ellipticals, and flattened spirals with star-studded arms. But far from all galaxies fit the Hubble sequence of nebular forms. In fact, when looked at closely enough, every galaxy is peculiar. Appreciation of these peculiarities is important in order to build a realistic picture of what galaxies are really like. But the peculiarities are also important for the reason that, if we could analyze a galaxy in the laboratory, we would deform it, shock it, probe it in order to discover its properties. The peculiarities of the galaxies pictured in this Atlas represent perturbations, deformations, and interactions which should enable us to analyze the nature of real galaxies we observe and which are too remote to experiment on directly. In general, the more conspicuous the peculiarity, the more illustrative it is of special events and reactions that occur in galaxies. From this range of experiments which nature furnishes us, then, it is our task to select and study which give the most insight into the composition and structure and the forces which govern a galaxy. The present Atlas specifically started from an attempt to better understand spiral galaxies. Despite even recent analyses from a contrary standpoint, I believe that gravitational orbits in a stellar assemblage will not alone furnish satisfactory explanations of galaxies. 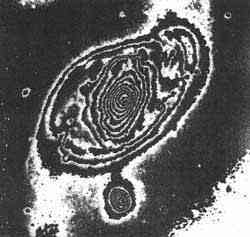 it is clear that the convolution which spiral arms are seen to undergo in certain galaxies cannot be performed by loci of stellar orbits. 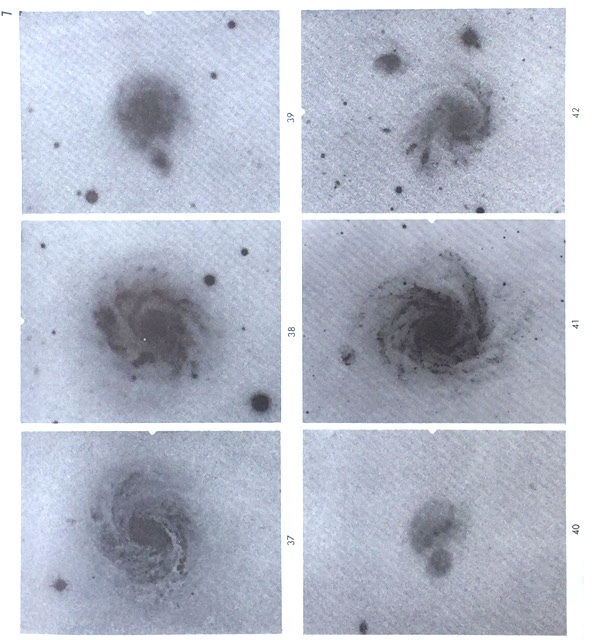 In the investigation of these special spiral properties, therefore, galaxies which showed unusual or perturbed arms or filamentary extensions were samples with high resolution photographs with the Palomar 200-inch telescope. Subjects were first drawn from the pioneering work of Zwicky and Vorontsov-Velyaminov. 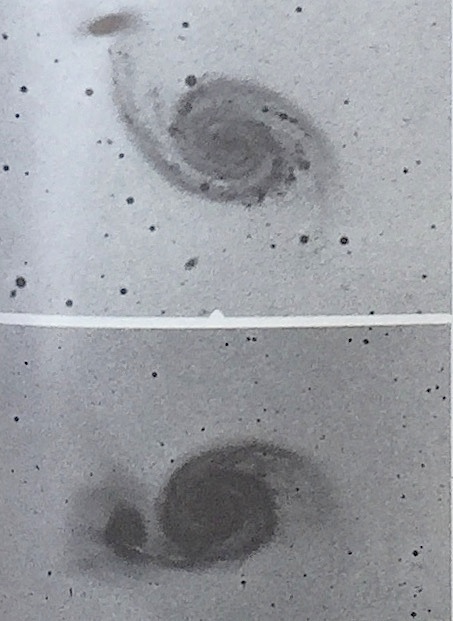 So many important objects emerged under high-resolution, limiting-magnitude study, however, that the investigation into the nature of spiral arms was temporarily postponed in order to organize systematically these new phenomena into groups and publish a representative sample of the best objects. 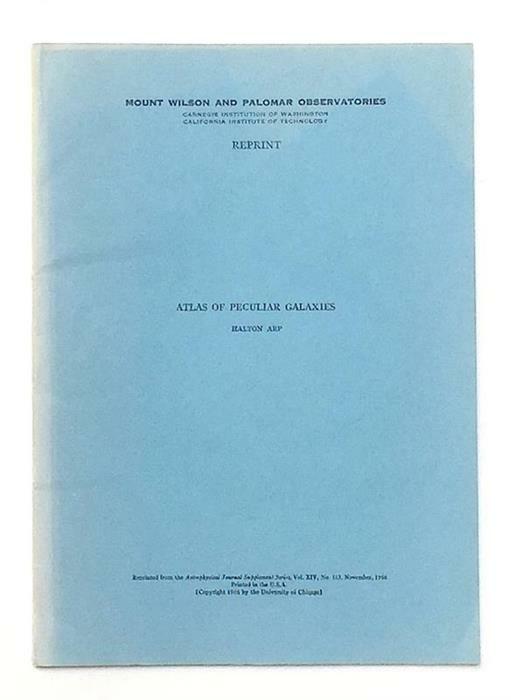 The Atlas as it has been realized in the following pages illustrates again that galaxies cannot be characterized as just assemblages of stars, radiation, and gravitation. The following Atlas pictures emphasize the importance of dust in some; they particularly imply a much more important role for the gas in general and point to the existence of new forces or forces which previously have been little considered. For example, the twisted distorted shapes and curious linkages pictured here attest to the fact that there are viscosity-like forces present that in some cases are dominant. Probably these forces are due to magnetic effects. Vorontsov-Velyaminov has stressed in the past the probable magnetic nature of these effects. Magnetic forces are very difficult to study, but may be very important in our Universe. The recent radio-astronomy discoveries of violent events in galaxies reveal sources of energetic charged particles. These charged particles interact with magnetic fields and offer the hope of mapping, measuring and understanding cosmic magnetic fields. Exploration of the connection between the plasmas observed with the radio telescopes and the optical evidences of plasmas effects pictured in the present Atlas is now open to us. The over-all aim of this Atlas is to present a number of examples of various kinds of peculiar galaxies. 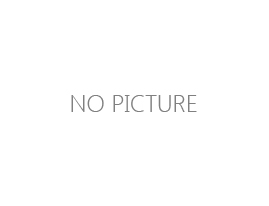 They are presented in groupings that appear roughly similar, thereby furnishing a rough, initial classification. Phenomena which each group represent may then be investigated by picking the most favorable members in size or brightness, studying different members of the group in different orientations, and, finally, making some preliminary statistics of certain kinds of phenomena and their relationship to other observable parameters. It is hoped that this investigative procedure will not only clarify the workings of galaxies themselves but will also reveal physical processes and how they operate in galaxies, and ultimately furnish a better understanding of the workings of the Universe as a whole." The Arp case provides a rare view of how science copes with dissent. Some might conclude that the dispute is a classic example of a dissident voice being stifled by a powerful majority. There is something of that, but there are other important aspects as well: How far from the mainstream of a given field can a scientist wander before he has effectively cut himself off from his colleagues. Atlas of Peculiar Galaxies, reprinted from the Astrophysical Supplement Series, Vol. XIV, No 123, 1966, Chicago, The University of Chicago Press, 1966; p. 20, 57 plts. 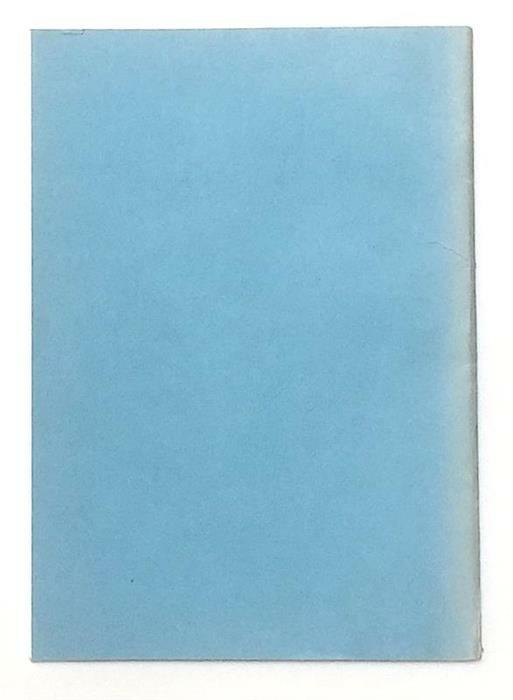 with illus., printed covers; 24 cm; sunned; fine condition.